Typing Assistant predicts and autocompletes your frequently used words and phrases anywhere. It makes typing faster, more intelligent and lowers effort. When typing, a smart Typing Assistant suggestion window opens to show you the possible words you are typing, then, with one key stroke, it automatically completes the word for you. 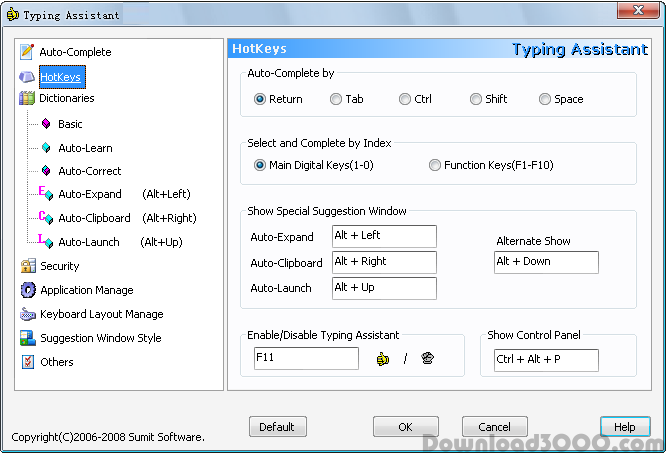 The program automatically learns the words you type, automatically corrects spelling mistakes, automatically expands user-defined shorthand to full text, automatically accesses clipboard history contents, and automatically launches user-defined applications/files/folders so that the more you use the program, the smarter it becomes and the more you find it useful. Typing Assistant is the ideal utility for authors, secretaries, journalists, translators, document creators and programmers; in fact, it's perfect for anyone who frequently uses a word processor. Type a word and get an entire letter! Typing Tutor for all levels and ages.